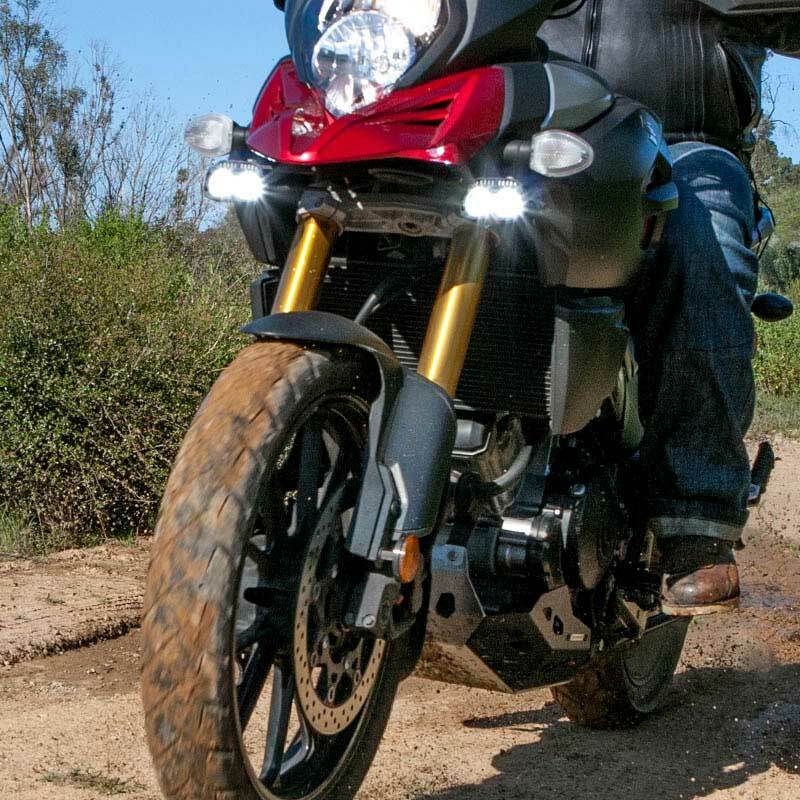  NiteRider reenters powersports market with aux lights for Adventure Bikes. 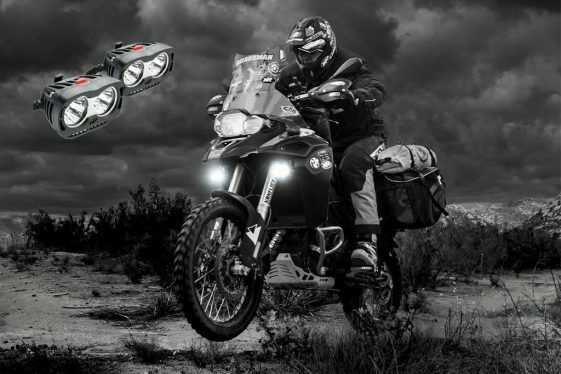 NiteRider has entered the powersports category with the Pro ADV 3600 Set, a rugged, powerful, lightweight auxiliary lighting system for adventure bikes. An ADV-specific product with advanced engineering, the ADV 3600 Set comprises of a pair of dual-beam CREE™ LED units that emit a combined 7200 lumens, resulting in a massive enhancement in visibility, greatly improving the ride experience on the highway or trail. Venting and cooling fins are incorporated into the heads, and multiple light levels are possible, including high and low beams and a daylight safety flash. Installation is straightforward, with black hard-anodized, machined-aluminum mounts and three plastic shims of varying thicknesses, and the lamps can be aimed in any direction. NiteRider also offers a version with a 1-inch ball for RAM mounting. Each package includes a well-thought-out wiring harness with handlebar-mounted remote switch and gold-plated, military-spec connectors. All cables feature high-quality rubber jackets that remain flexible even in very cold conditions. The Pro ADV 3600 Set is equipped with 12 high-quality CREE™ LEDs and comes with a Remote Switch that mounts to your handlebar for easy operation. Wiring harness, handlebar-mounted switch, and mounting hardware are all included. While NiteRider may be an unfamiliar brand to some ADV enthusiasts, the company has earned a stellar reputation for its high-quality auxiliary mountain bike lighting, and their new offerings for adventure bikes maintain this no-compromises approach, with U.S. construction and painstaking attention to detail. This actually marks a return to powersports for NiteRider, whose HID and halogen products were prominently featured in the 2005 Baja 1000 film Dust to Glory before the company focused on its core market during the economic downturn. In the meantime, NiteRider has been a pioneer in adapting LED technology to portable-lighting applications. 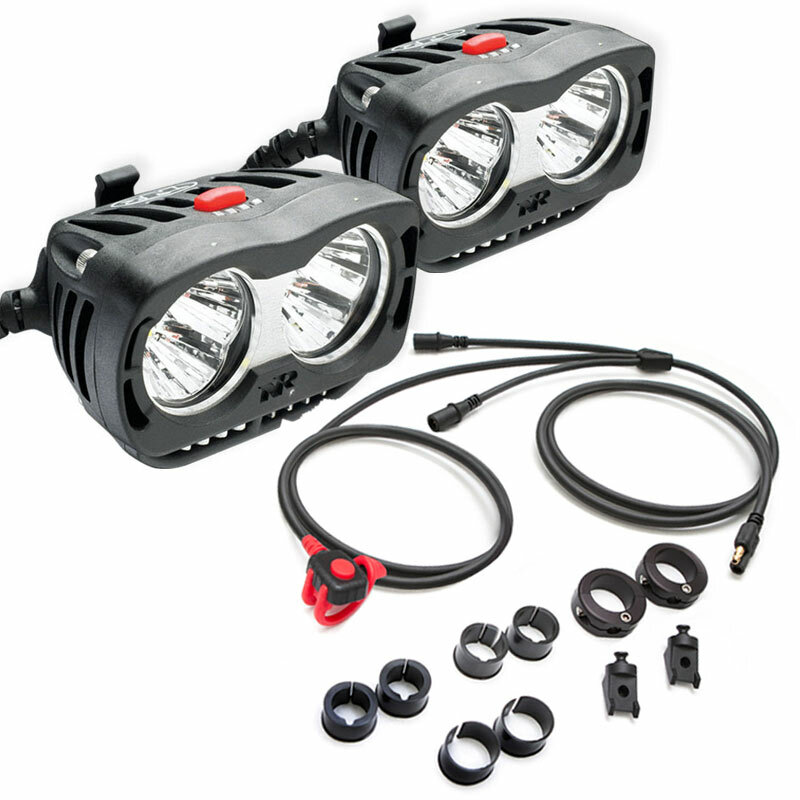 The Pro ADV 3600 Lighting system is designed to deliver long-lasting operation. The system uses CREE™ LEDs, the highest performing LEDs on the market. • Two dual-beam CREE LED 3,600-lumen headlamps (7,200 combined lumens). • Borofloat® Lens – high quality glass lens. • Rugged, lightweight, off-road-specific design. • Multiple light-level modes – low, high, daytime running (safety flash). • Includes wiring harness, handlebar remote switch, and mounting hardware. • Custom reflectors designed for off-road riding. • Designed, quality-tested, and hand-assembled in San Diego. Suggested retail price on the ADV 3600 Set is $599.99. For more info, visit www.niterider.com. What is the current draw per each lamp at 12 VDC? I wouldn’t’ve thought that flashing front lights were legal for a motorbike, anywhere ….. so the flashing mode would be superfluous. Headlight modulators are legal; I think as long as it’s not a side to side (wig wag) style, it’d be fine. These are waaaaay out of my price range. I’ll stick wtih the $300-ish Denalis from Twisted Throttle. I have a couple sets of those and they’re outstanding. While I don’t doubt these NiteRiders are better, it’s just not something I can afford.